The PC10420 Series of Network Interface Modules (NIMs) links PC/104 compatible computers with the ARCNET local area network. It uses the COM20020 ARCNET controller chip and has features such as command chaining and an internal 2K x 8 RAM buffer. Bus contention problems are reduced since the module only needs an I/O address. There is no requirement for wait-state arbitration. Each PC10420 has two LEDs on its board for monitoring network operation and bus access. The green LED shows the module is receiving data on the network and the yellow LED indicates bus access to the module. This product also has an external 8-bit DIP switch so that node addresses can be easily reassigned without removing the module. The PC10420 is available in eight transceiver options. Each transceiver, which is matched to a particular cable type, is identified by a three-character suffix appended to the model number. The capability of each transceiver differs. The PC10420-CXS accommodates coaxial star configurations-requiring external active or passive hubs if other than peer-to-peer topology is desired. The PC10420-CXB supports a coaxial bus configuration, usually without hubs. The PC10420-TPB supports twisted-pair bus cabling using RJ-11 connectors. For EIA-485 signaling, the PC10420-485D supports DC-coupled cabling. If the software driver you intend to employ sets the COM20020 into backplane mode, you will need the PC10420-485 version. 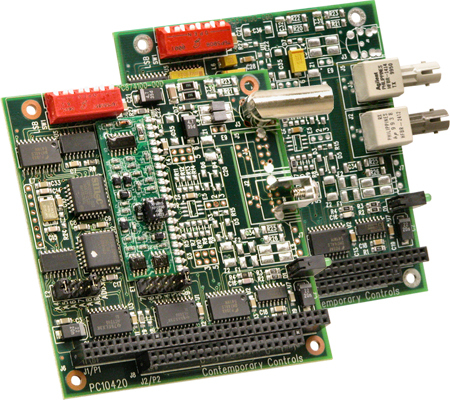 The AC-coupled EIA-485 transceiver offers certain advantages. Signal polarity is of no concern, and no bias adjustments are necessary since each transceiver has its own fixed bias network isolated by a pulse transformer. However, DC-coupled technology offers longer distances and will operate over all six data rates.